AppleCheeks Bamboo Insert 2-Pli​ contains two layers of ultra soft 70% Rayon from bamboo/30% organic cotton for ultimate absorbancy! Fold this approximately 12" x 15" insert into thirds and you get six layers in the soaker zone. Rayon from bamboo is perfect for the heaviest wetter as it retains twice as much moisture as cotton alone for its weight! And plus bamboo's antimicrobial properties make it the healthy choice for your baby's bottom. *Note: This insert is not pre-shrunk. I like the softness and trimmness of these inserts but don't find them to be exceptionallly absorbant. However I like for my small baby so that her diaper is trim enough for her to move. You'll only have to try these once to toss your other inserts. They are high quality, very durable, very absorbent and they wash like rags!! Stock up on them when they go on sale. I love them so much I don't mind paying full price from time to time. Love applecheeks products. High quality and durable. These inserts are no exception - great absorbency. Lol I stock up whenever these go on sale!! 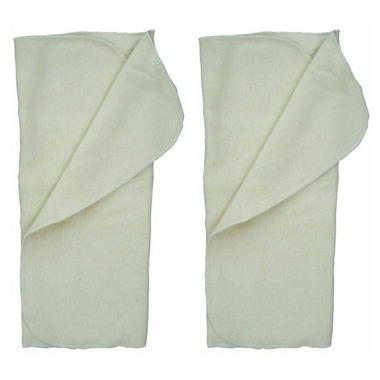 Great inserts, quick to dry and very absorbent. Super soft. Can't wait to try them out. Great absorbency and fit perfectly in Applecheeks size 1 diapers! I love these inserts. They are a good size, absorbency is great and they wash up very nicely. I wish they were my entire stash! Great stuffer. Second only to the Apple cheeks 3 ply. I wrap these around an AMP hemp booster, and have trim, bullet proof diapers!